Nature is mysterious and hides many surprises – even in entirely unspectacular locations. I chose this path as a motif precisely because it led so innocuously through a grove of palm trees. While I painted, Warren, Summer Sunny and Klaus rested in the shadows, but the waiting ultimately became too much for Warren, an Australian volcanologist and Samoa expert. 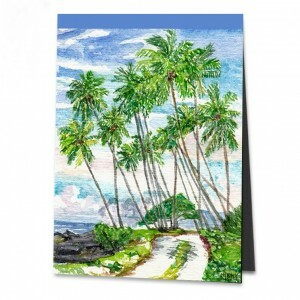 “Klaus,” he asked and pointed at the distant tree between the palms, “do you recognise that? It’s referred to as a ‘butterfly bush’. It produces a scent that attracts male butterflies. Come on, I’ll show it to you. It’ll be surrounded by enamoured butterflies”. Klaus returned from that short expedition with many beautiful photographs. And now every time I look at my painting, I think of the white butterflies intoxicated by desire and wonder just how bewitching the tree must smell.